Hereford is a cathedral city and county town of Herefordshire. 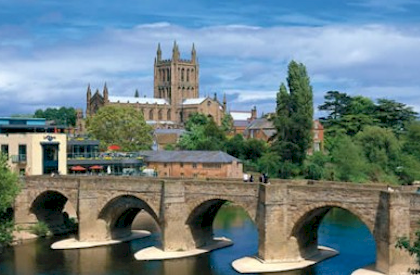 It lies on the River Wye, approximately 16 miles east of the border with Wales, 24 miles southwest of Worcester, and 23 miles northwest of Gloucester. Herefordshire is a global centre for cider production as it supports many acres of orchards.